As many Informer readers know I am blind. I have little to no central vision leaving me with only peripheral. Like many children of the 90's I remember watching Star Trek the Next Generation. I was never a big Star Trek fan but something about the Next Gen always drew my attention. Geordi La Forge, the engineer, was completely blind and unlike the time I was living in, the Star Trek universe had an answer. Geordie had a futuristic looking visor that allowed him to see. Obviously I felt a connection to this character and dreamed of the day our own technology would match his. The world has a way of moving on though and as it did Geordi and Star Trek took up residence in the dusty recesses of child hood memory. That is until last week. I was on vacation with my family when it all came rushing back. We went to a little putt-putt golf course, Somerset Falls Family Park in Somerset, KY, and inside a kind older gentleman that somehow still had the spark of a child in his eye introduced me to Virtual Reality (VR). He had an HTC VIVE where he was allowing people to try it out for the modest price of only five bucks for fifteen minutes. Of course being the gamer that I am I had to jump on the chance. Within minutes of trying on the headset and starting my first game I began to think back to Geordi and realized VR is much more than just the future of gaming, its very close to Geordi's visor and could be a remarkable bridge for disabled people. The first thing I was struck by was just how good the VIVE was. I don't know what I expected but it wasn't what I experienced. The graphics were as good as any gaming PC I've ever used and it was relatively simple to use. The part I wasn't ready for was just how immersive it truly was. I instantly found myself in a Jurassic period forest with dinosaurs all around me. The controllers I held looked like realistic pistols that were the only things that stood between myself and hungry dinosaurs. Next I was parachuting out of a WWII plane over Germany behind enemy lines. I felt as if I was falling and could see the ground rising up below me and my parachute above me. I tried different games for nearly an hour. I was like the kid with a pocket full of quarters at the arcade. When I was finally able to drag my self away and was on the way back to our cottage I couldn't help but to think about all the things I had just experienced. They felt so real, looked so real, and I thought this could allow me to do things that I only ever dreamed of. Not only that, but this technology could help so many people with disabilities. From cognitive to physical, VR could help give people a fuller quality of life. 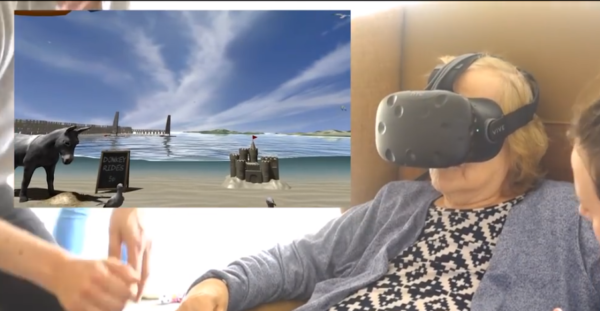 VR is also on the cutting edge of rehabilitation; its a tool that goes far beyond gaming although gaming might just be the medium in which VR becomes accessible for greater numbers of people. Let's take a look a tertiary view of what VR can do for disabled people starting with cognitive disabilities. The University of South Florida in Tampa has a program called VR for VR. This stands for Virtual Reality for Vocational Rehabilitation. They focus on people with cognitive and physical disabilities in the program. The most common being TBI, Asperger's and some learning disabilities. The program allows people with different disabilities to do simple tasks like counting money, stacking boxes, gathering carts, and other simple tasks you may encounter in an entry level position. While the participant is trying to do these tasks they are constantly being distracted by barking dogs, crying babies and irratic drivers. The program has been successful in its goal of helping people with disabilities get hired by showing the employers that the individual can handle the task. The biggest benefit of the program is that you can create many different scenarios in complete safety. For more on this program check out https://www.youtube.com/watch?v=s3rEAIwLEXM. People with mobility disabilities, various degrees of blindness and deafness can do things they couldn't do in real life through VR. I know from personal experience that I can never drive a car but in VR I can without the fear of hurting someone else or myself. The fun and sensations I felt while trying VR definitely felt real and it feels like you are doing whatever it is that your doing in VR. Someone in a wheelchair could hike Kilimanjaro or scuba drive on the Great Barrier Reef. The ability to get outside of your house even in a virtual world means so much to people that have a hard time doing that normally. VR has even been successful in helping people with different types of phobias. Probably the most touching way VR is changing lives though is for the elderly and children with cancer or other life threatening diseases. My experience with VR is probably the best gaming experience I've ever had. It was so fun to be a part of another world. To co-exist with dinosaurs in a Jurassic forest was truly breathtaking. However for all of the fun I had it didn't take long for me to realize what a powerful tool VR is. The more accessible it becomes from a cost stand point the more people will try it and realize its immense potential. VR already allows me to do things that I otherwise can't do but because of its technology I feel that we are not far from Geordi's visor. As soon as we can tie into the optic nerve its case closed I'll be as good as new. Its funny to think that a science fiction show I watched sometimes as a teen could be so close to reality today. Its only a matter of time before VR is developed more in the future and can help even more people all while entertaining the rest. With that there's only one thing left to say "Geordi you have the bridge". Until next time, Happy RuneScaping. 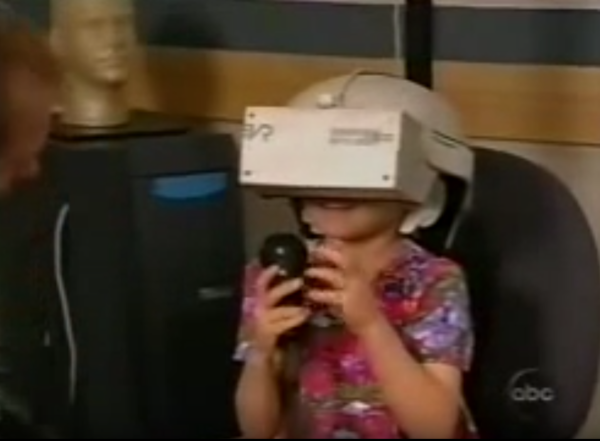 Post subject: Re: [Informer] Geordi You Have the Bridge: VR is Bridging.. This was a nice article. I'm glad you had a fun time with the VR.